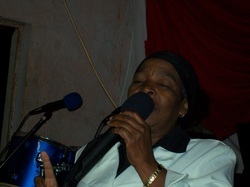 “Seek ye first the Kingdom of GOD” by Mrs Johana Mukhavhuli , Wednesday Service, the 18th April 2012. “33 But seek first the kingdom of God and His righteousness, and all these things shall be added to you.” Matt 6:33, NKJV. Nowadays too many people go to church for their own personal reasons and are not really interested in God. First and foremost we must look for the kingdom of God. This will make us unique. Even our lives will be different from the live of the others in the community. The word of God in Isaiah 55:11 states “11 So shall My word be that goes forth from My mouth; It shall not return to Me void, But it shall accomplish what I please, And it shall prosper in the thing for which I sent it.” Isa 55:11, NKJV. God wants His word to dwell in us because He is the word. It must dwell in us. Today people mix God with their gods. They feel that God is not enough. Some of us only go as far at the door of the church but do not go in. We don’t get involved with what is happening inside the church. Let’s go after the word of God not the miracles. One artist sings to say that everything that God does is good and that is why I say it is well with him if God is with him but because he is with God he says all is well. He says it is well even when there is no food in the house. This is only possible if you are full of the word of God and His presence. Even if you don’t eat good food and where you are staying is not a nice place you are going to say it is well, it is well if I am with the Lord. “6 Seek the Lord while He may be found, Call upon Him while He is near.” Isa 55:6, NKJV. Look for the Lord whilst he can still be found. There will come a time when you will look for God and not find Him. His grace will move away. So look for Him whilst He can still be found. Some are in hospital as we speak and they are looking for God can can’t find Him, they are looking for a pastor who can come and speak the word of God to them or read it for them or at least pray for them and none of the above is coming their way in that hospital bed. There are Christians who are still confused. They are standing at the door of the church blocking the way even for those who want to come in. The bible says Maria spoke to Jesus Christ but when Martha came she bowed down to Him. Maria reached Jesus Christ but she did not really get to Him, but Martha knew how to arrive. Let’s not miss the destination. People are running up and down looking for miracles. The destination is the kingdom of God and His righteousness Matt 6:33, NKJV. They are looking for a church that does this and that miracle. “I now have a car; I have now built a house because of this church.” They will never tell you about the word of God, all they talk about is what miracle happened in church. Let’s love the word of God more as it will build us and it will also build the church. Let’s not stand at the door of the church, were we can’t receive the word of God as this will make our church, a place where people will devour each other.